Find out what the standard tuition charge is for U.S. colleges, and how California University of Management and Sciences compares. Learn how the tuition and fees at California University of Management and Sciences compare to other universities and colleges and find out what you can do to effectively plan for possible price increases. How Does California University of Management and Sciences Measure Up To Other Schools? For nationwide, regional and statewide comparisons, view the following table to see how California University of Management and Sciences measures up to other schools. How Much Will Tuition & Fees Be for California University of Management and Sciences? In the 2017 - 2018 school year, regular undergrads at California University of Management and Sciences were charged $9,570, prior to corrections for financial need. $9,360 was the cost of tuition. $210 was fees. As opposed to public colleges, California University of Management and Sciences does not offer a tuition discount to residents of the state. Fees and tuition prices quoted on this page do not include room and board, which will increase your costs. However, many students wind up having to pay under full tuition because they get financial aid as well as other discounts. How much does California University of Management and Sciences cost per credit hour? California University of Management and Sciences tuition and fees have remained stable for the last five years. We anticipate the cost of tuition and fees for this year will total $9,570. If tuition charges remain stable, two years at this school will run you $19,140 and four years will run you $38,280. On top of that, you will probably have added costs such as room and board, books and, transportation. 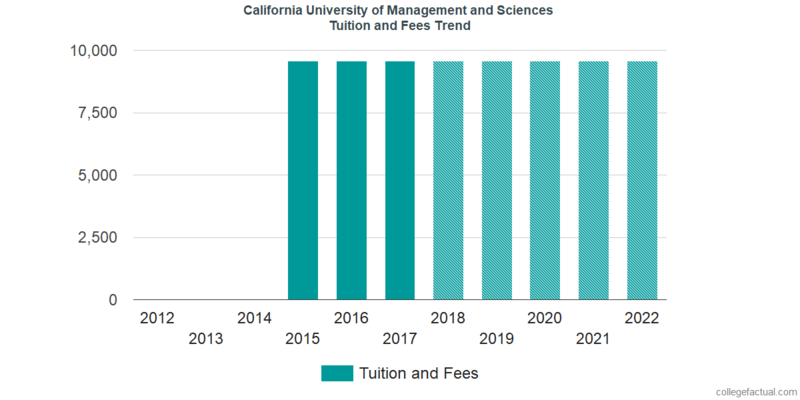 Look at the following chart to see how California University of Management and Sciences tuition and fees might develop in the future. At most schools you'll end up spending more for your last year of college than you will in your first. This is due to yearly price increases. It's smart to be aware!